I remembered that in Nightfire PC version, you were able to use some codes and cheats by console. So I run the Nightfire Source and set up my server. I tried to add bots, but I didn't know where I should type bot_add. Is there some console where to type that or should I download the same thing that was available in Nightfire? I took a screenshot where you can see what I mean. 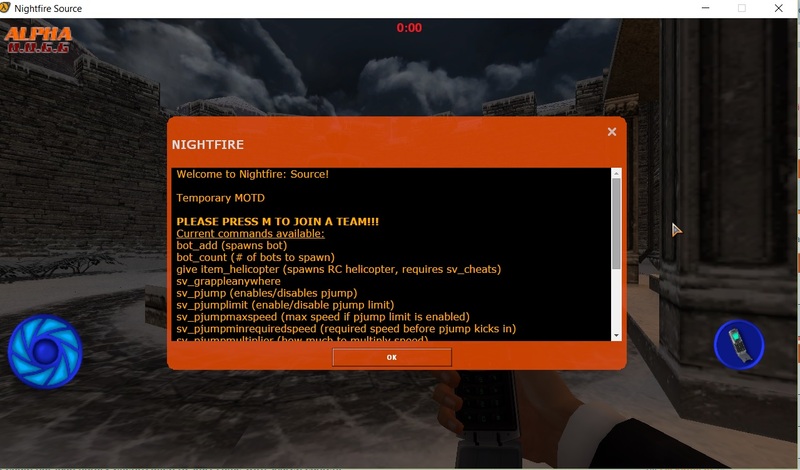 Nightfire Source has bots but they are in a very early test phase due to it being very difficult to programme. Bots are controlled with 'bot_add' and "bot_count" console commands. Okay, thanks for answering! But how can I find that console or make it available? Game menu > Options > Keyboard > Advanced, make sure that Enable Developers Console or something like that has been marked on. I guess the standard key to open it up will be ~ (`) (left side of number 1 and under ESC (For QWERTY at least)). Please let me know if you managed to find it. I tried it and it didn't work. It was actually enabled already and I tried earlier that same key. If you're referring to adding them to a dedicated server, you will need to either do it through the rcon command in-game through the console or input the bot_add command directly into the server console. As far as creating a game from the main menu goes though, you should be able to execute "sv_cheats 1" and "bot_add" while in-game without a problem.